When your specific type of fixture does not appear in the list, you can create one yourself. You do this by clicking the gear icon next to the Fixture selection drop down. This will open the Fixture Editor. You can create a new fixture, adjust an existing fixture or duplicate an existing fixture and go from there. Let's start by creating our own personality from scratch by hitting the plus icon on the bottom. This creates a default 1 RGB pixel fixture called New Fixture. The first thing you'll want to do is change the name to something that makes sense to you. The manufacturer name and the amount of pixels are usually a good convention. Note that if you update an existing fixture, and this fixture is already being used on the Input Selection stage, you will update all instances of the existing fixture as well. If you want to make changes without affecting the current setup, make a duplicate of the fixture preset first. Then you can set up the parameters. If you're dealing with a basic LED tube or tile, you can just assign the amount of pixels you need vertically and horizontally. On the right you will see a preview of how your fixture is arranged. So a 16 pixel LED strip would have a width of 16 and a heigh of 1. A square LED tile with 64 pixels would have a width of 8 and a height of also 8. Depending on the type of fixture, it could be that certain channels are reserved for specific features of that light. For instance it could be that the first channel switches between different chase presets. You see this often in off-the-shelf LED tiles. Your light will have info about this in its user manual. In these cases, you can create extra parameters by clicking on the + icon in the bottom of the Parameters tab. 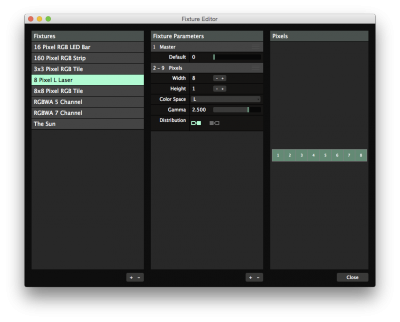 You can re-arrange their order by dragging them up or down, using the three bar handle on the right of the parameter, similar to how you drag effects up and down in Resolume's effects tab. This way your light will get the correct pixel data at the correct channels, without having to offset the Start Channel. Tip! Sending nothing is not a concept that exists in DMX. When you assign a channel, the DMX protocol expects you to always send a value on that channel. So Resolume will send the value you set as Default. So if you are adding a Dimmer channel to a fixture, you'll want to set the Default to 255. For ease of use, you can of course rename these parameters as well. Now is also a good time to adjust your distribution if necessary. Your distribution refers to how your pixels 'snake' through your fixture. Some fixtures start at the top left, and then keep going left to right, like you would read a page of a book. Other fixtures start top left and zigzag back and forth on their way down. You can come across pretty much every variation of this, which are all covered with the 16 distribution options. When you change your distribution, you’ll also see the channel layout change in the preview. Then you can choose the colour space you want to use with your fixture. Full colour LEDs create colour using separate values for red, green and blue. Depending on the strip, either separate red, green and blue LEDs or a single full colour LED are used for each pixel. Selecting RGB (or one of its variations) assigns 3 channels for each LED in your strip. Mono coloured LEDs use the weighted luminance value of the sampled pixel. 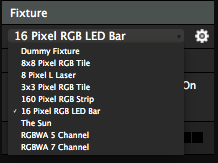 Selecting L will send this luminance value over a single channel for each LED in your strip. Some lights prefer to work with CMY values instead of RGB. Here Resolume does a regular 1:1 conversion from the pixel's RGB values to the CMY color space. 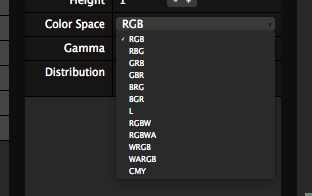 Resolume also supports less common varieties such as RGBW and RGBWA. We approximate the color on the extra white and /or amber LEDs by dimming the other channels and sending out on this channel instead. If you're dealing with an unusual type of LED, you can tweak the Gamma Correction of the LEDs. Most of the time the default setting of 2.5 should be fine.